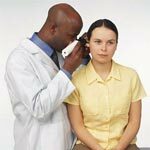 Ear infection symptoms most often start a couple of days after an onset of an upper respiratory bacterial or viral infection that may subsequently spread into the middle year. If you or your child develops ear infection symptoms after a bath, shower or swimming, it might be due to swimmers ear infection that is caused by trapped water inside your ear canal. Swimmers ear infection responds well to topical ear infection drops that can be purchased at your local pharmacy. Young children and infants are especially prone to developing otitis media that might be hard for parents to detect but some ear infection symptoms can provide you with a clue to seek medical attention like high fever, crying, itching or touching ears, hearing loss, inability to self-soothe, loss of appetite and possible ear drainage. Most ear infection symptoms resolve without medical intervention but in rare cases, collected middle ear fluid will cause an ear drum rupture that heals quickly on its own. 1. Ear pain that ranges from mild discomfort to severe pain. 3. Popping, clicking and white noise sounds in the ear that might be due to middle ear fluid collection. 4. Ear drainage that might be clear, yellow or bloody due to possible ear drum rupture. 5. Loss of appetite and generally feeling down. 6. Muffled hearing or even a degree of hearing loss. 7. Dizziness and loss of balance while walking. If you are experiencing any of these symptoms, it might be necessary to look for ear infection treatment that will help you manage your ear pain, fever and assist body in fighting infection. Heat applications to the ears might be very soothing and additionally help you relax and fall asleep. One of the best ear infection cures are garlic oil ear drops that you can easily make at home by crushing a garlic clove in olive oil and instilling a couple of drops in your ears. In addition, you can try a hot water bath for you feet with addition of a tablespoon of chili pepper to increase blood circulation and speed up healing.